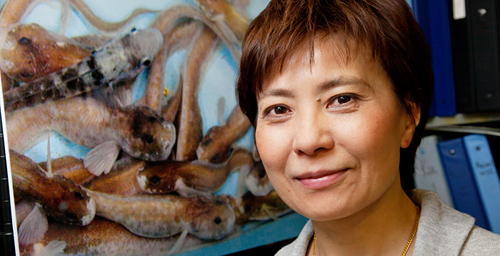 Illinois animal biology professor Christina Cheng led a study that traced the evolution of a gene for an antifreeze protein in an Antarctic fish from the gene for a protein with an entirely different function. CHAMPAIGN, Ill. - Researchers report that they are the first to show in molecular detail how one gene evolved two competing functions that eventually split up - via gene duplication - to pursue their separate destinies. 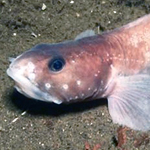 The researchers traced the evolution of a gene in the Antarctic eelpout (Lycodichthys dearborni) that enables it to survive in the icy waters of the Southern Ocean. The study, in the Proceedings of the National Academy of Sciences, validates a decades-old hypothesis about a key mechanism of evolution. The study also confirms the ancestry of a family of "antifreeze proteins" that helps the Antarctic eelpout survive in the frigid waters of the Southern Ocean. "I'm always asking the question of where these antifreeze proteins come from," said University of Illinois animal biology professor Christina Cheng, who has spent three decades studying the genetic adaptations that enable Antarctic fish to survive in one of the coldest zones on the planet. "The cell usually does not create new proteins from scratch." Scientists have known since 2001 that the sequence of genes coding for a family of antifreeze proteins (known as AFP III) was very similar to part of a sequence of a gene that codes for a cellular enzyme in humans. Since Antarctic fish also produce this enzyme, sialic acid synthase (SAS), it was thought that the genes for these antifreeze proteins had somehow evolved from a duplicate copy of the SAS gene. But no study had shown how this happened with solid experimental data. Cheng and her colleagues at the Chinese Academy of Sciences began by comparing the sequences of the SAS and AFP III genes. There are two SAS genes in fish: SAS-A and SAS-B. The researchers confirmed that the AFP III genes contain sequences that are most similar to those in a region of SAS-B. They also found a sequence in the SAS-B gene that, when translated into a new protein, could - with a few modifications - direct the cell to secrete the protein. This slightly modified signal sequence also appears in the AFP III genes. Unlike the SAS enzymes, which remain inside the cell, the AFP III proteins are secreted into the blood or extracellular fluid, where they can more easily disrupt the growth of invading ice crystals. "This basically demonstrates how something that 'lives' inside the cell can acquire this new functionality and get moved out into the bloodstream to do something else," Cheng said. Further analysis revealed that the SAS proteins function as enzymes but also have modest ice-binding capabilities. This finding supports a decades-old hypothesis that states that when a single gene begins to develop more than one function, duplication of that gene could result in the divergent evolution of the original gene and its duplicate. The new finding also supports the proposed mechanism, called "escape from adaptive conflict," by which this can occur. According to this idea, if a gene has more than one function, mutations or other changes to the gene through natural selection that enhance one function may undermine its other function. "The original enzyme function and the emerging ice-binding function of the ancestral SAS molecule might conflict with each other," Cheng said. When the SAS-B gene became duplicated as a result of a copying error or some other random event in the cell, she said, then each of the duplicate genes was freed from the conflict and "could go on its own evolutionary path." "This is the first clear demonstration - with strong supporting molecular and functional evidence - of escape from adaptive conflict as the underlying process of gene duplication and the creation of a completely new function in one of the daughter copies," Cheng said. "This has not been documented before in the field of molecular evolution." Cheng said that even before the gene for the secreted antifreeze protein was formed, the original SAS protein appears to have had both the enzymatic and ice-binding functions. This suggests that somehow the SAS protein (which is not secreted) acted within the cell to disrupt the growth of ice. This could have occurred "in the early developmental stages of the fish," Cheng said, since the eggs are spawned into a cold environment and would benefit from even the modest antifreeze capabilities of the SAS protein. Later, after the SAS gene was duplicated and the AFP gene went on its own evolutionary path, Cheng said, the antifreeze protein appears to have evolved into a secreted protein, allowing it to disrupt ice formation in the bloodstream and extracellular fluid, where it would be of most benefit to the adult fish. The National Science Foundation and the Chinese Academy of Sciences supported this research. Editor's note: To contact Christina Cheng, call 217-333-4245; e-mail c-cheng@illinois.edu. The paper, “Evolution of an Antifreeze Protein by Neofunctionalization Under Escape From Adaptive Conflict,” is available online.